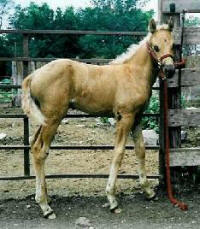 Palomino result when a chestnut horse inherits one cream gene. 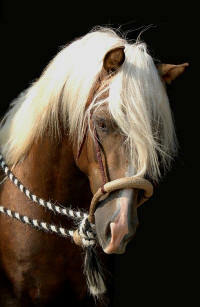 The red hair on a palomino is diluted, usually to some shade of gold. 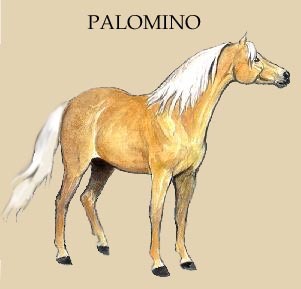 However, palominos can range in shade from nearly white to a very dark, sooty brown shade, often with heavy dappling. Sometimes these very dark palominos are mistaken for flaxen liver chestnuts or silver dapples. 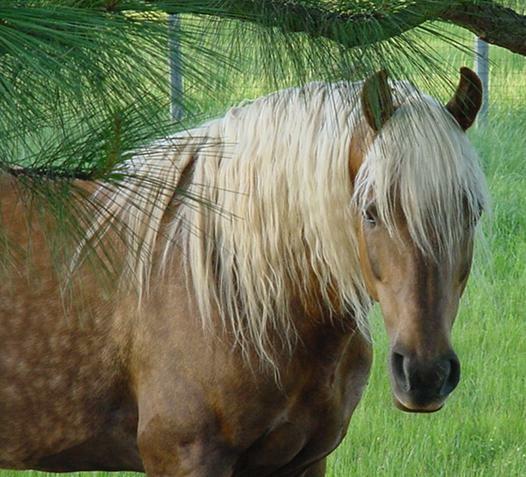 Palominos have a white mane and tail, although on very dark palominos, the sooty gene causes dark, silvery gray hairs to appear in the mane and tail. All palominos have at least one cream dilute parent. b. Buck (Imperial X Nellie), 1930 buckskin mare. Found in the numerous lines of descent from her daughters, Yellow Girl and Smokie. 4. Cotton Hill Daisy (Amigo Mick X Daisette), 1949 palomino mare. The source of Cotton Hill Daisy's cream gene is unknown, but may have come from her granddam Madonna, a black daughter of Go Hawk (black, with no apparent cream dilute lines) and Red Ruby (who may have been some sort of cream dilute, misregistered as chestnut- her dam, Ruby, is also the maternal great grand-dam of Night Tide). Cotton Hill Daisy's color line is represented by horses from Sunup Neptune lines. 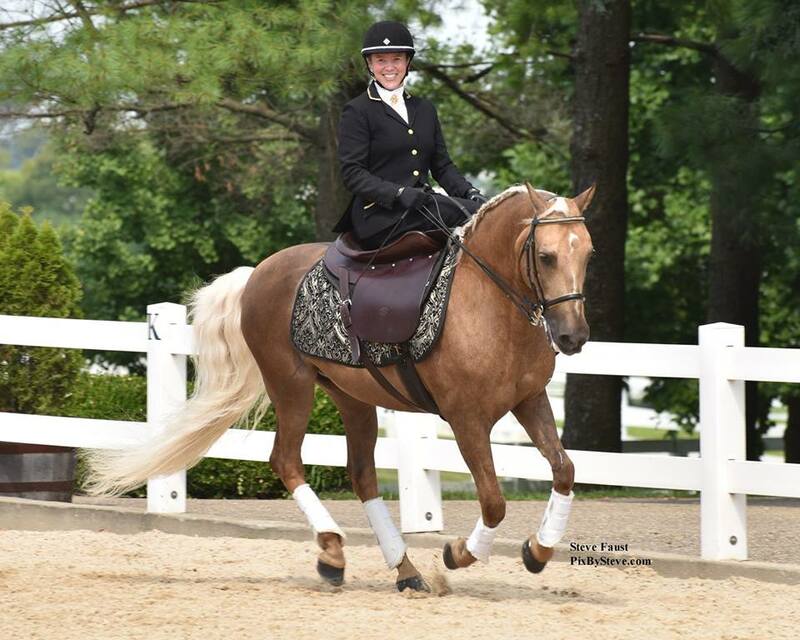 G' MYSTIC HAWK (Robbi Sue's Ragtime x BTMR Blackhawk's Alexis) 2004 palomino gelding, shown here being ridden sidesaddle at the Kentucky Horse Park by Karen Rozanski Martz. 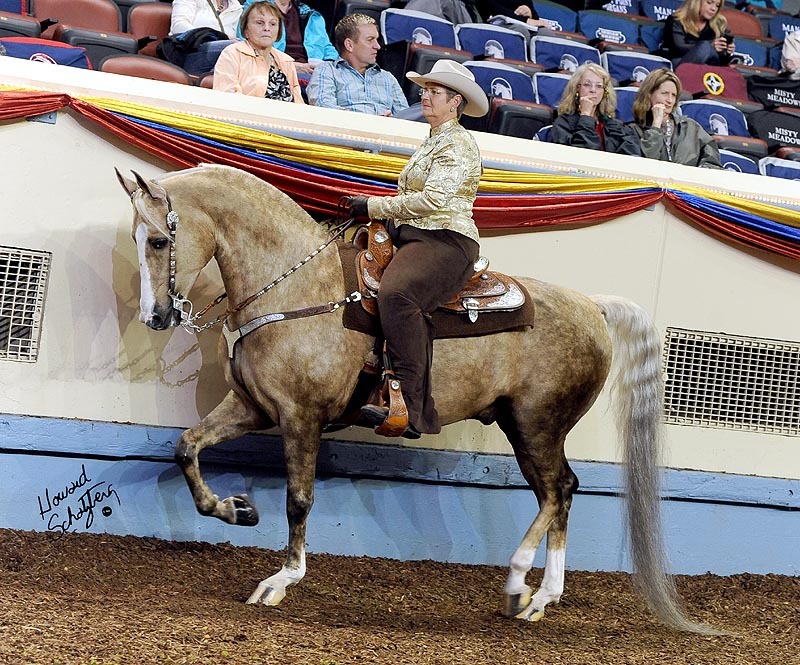 CFF STRICTLY BYZNESS (MEMC Tequila Cuervo x GLB Like Nobody's Byz) 2005 palomino gelding owned by Carlino Family Farm, shown at the 2011 Morgan Grand National and World Championship Horse Show. Photo taken by and copyright of Howard Schatzberg. SHALLOW CREEK'S ANNA (Shallow Creek Cuervo Gold x HRG Jackson Hole), 2002 palomino mare owned by Celebrity Morgans. 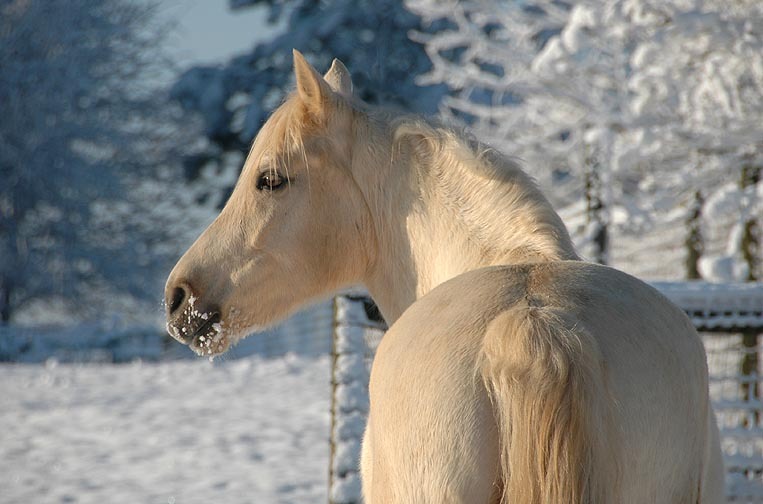 Anna is the "classic" gold color most often associated with palomino. Photo by Casey McBride. 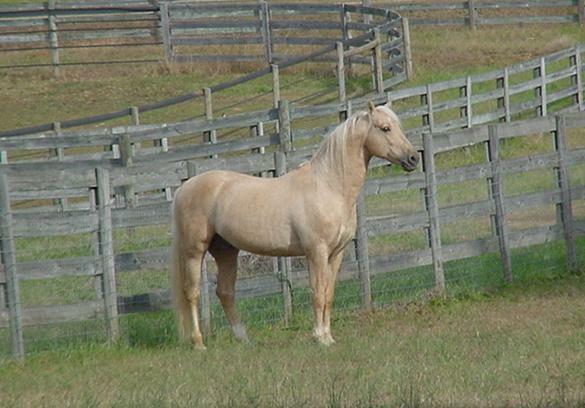 FARCEUR'S GOLDEN ANGEL (Farceur's Fool's Gold x Serr's Princess), 2001 palomino mare owned by Orleeta Thompson. The darkened mane and top of tail is thought to be caused by the sooty gene, though it is unknown why sooty can sometimes be so selective rather than covering the entire horse, as with our next example. Photo courtesy of Ingela Isetoft. 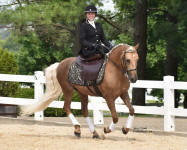 HEATHERMOOR GOLD BANNER (Windflower Tatertot X VMF Last Chance for Gold), 2000 palomino gelding owned by Keena Pettet. Yes indeed, he is palomino! 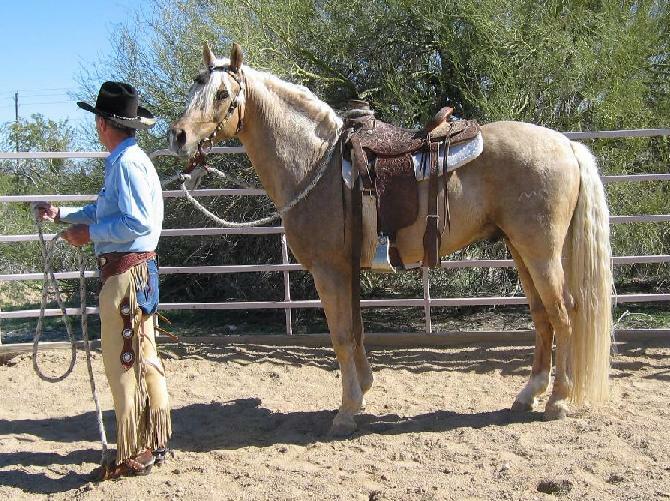 As a young horse he was a much more typical golden palomino. With age, the sooty gene has darkened him so completely that he could be mistaken for a dark chestnut or maybe even a dark bay. A subtle hint as to Banner's true color is the golden "undertones" peeping through the soot in the throat and cheek areas. Photo by Deana Fleenor, courtesy of Ben and Karen Thompson. 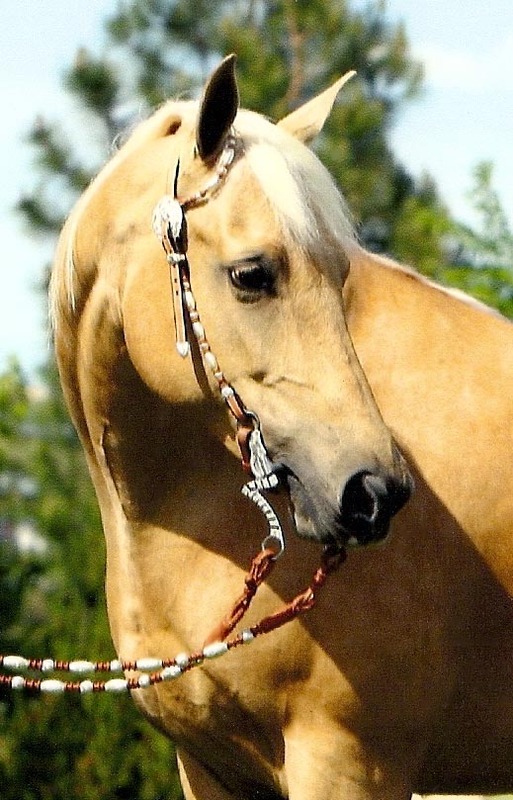 MYTHIC FERONIA (Mythic Aladdin X Coal Creek Honeypatch), 1998 palomino mare bred by and ridden by CeAnn Shipley, Mythic Morgans. Owned by Ann Thomas. 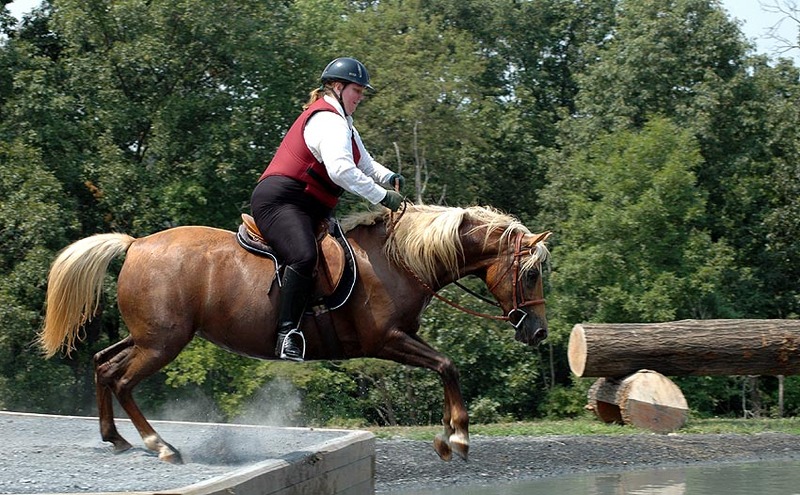 Shown at an August 2007 Cross Country clinic with Oliver King in August 2007. 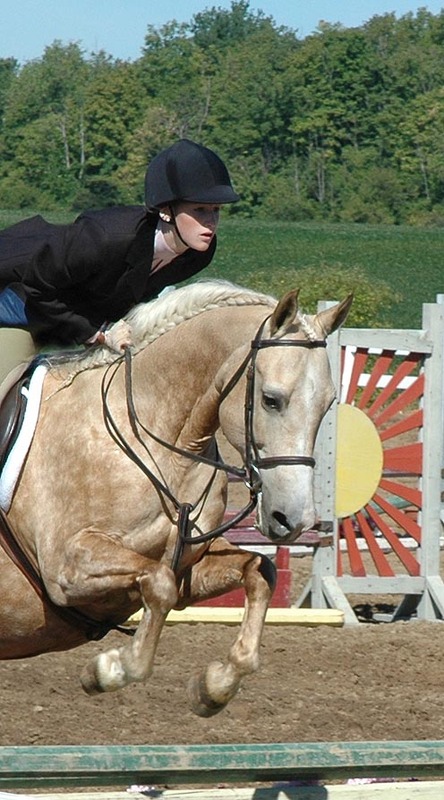 M & M K'EHLEYR SURPRISE (Shatona Karzan X Contessa), 1994 palomino mare, shown here ridden by Hilary Kierkvliet at the London Horsemanship Open Hunt Show, August 2007. Photo courtesy of Mary Freeman. SEASON'S MISS EFFIE (Northerly Llwellyn X Fox Creek Madolyn), 2002 palomino mare with her 2006 buckskin filly by EF Hot Wheels. Effie was bred by Colleen McNichol of Four Seasons Farm in Jordan, MN. GAB CREEK GOLDEN VAQUERO (PKR Primavera Brio X LBF Gay Enchantment), 2003 palomino stallion owned by Gab Creek Farm in Dahlonega, GA. Photo by Laura Behning. ANTIGUA CORAZON DE ORO (Mortana Pat X Angel's Breezy Lady), 1998 palomino stallion owned by Antigua Morgans, Dorothy Hallock, Phoenix AZ. Shown with Mike Thomas. Photo by Dorothy Hallock. WORLD'S EDGE SUN BEAR (Californio X Funquest Ruby), 1987 palomino stallion owned by Lisa Holec, Senoia, GA. Photo by Laura Behning. GEMHILL GEM MASTER (Ida-Ho Sir Patrick X San Willidust), 1998 palomino stallion owned by Gem Hill Farm, Debbie Bell, WA. 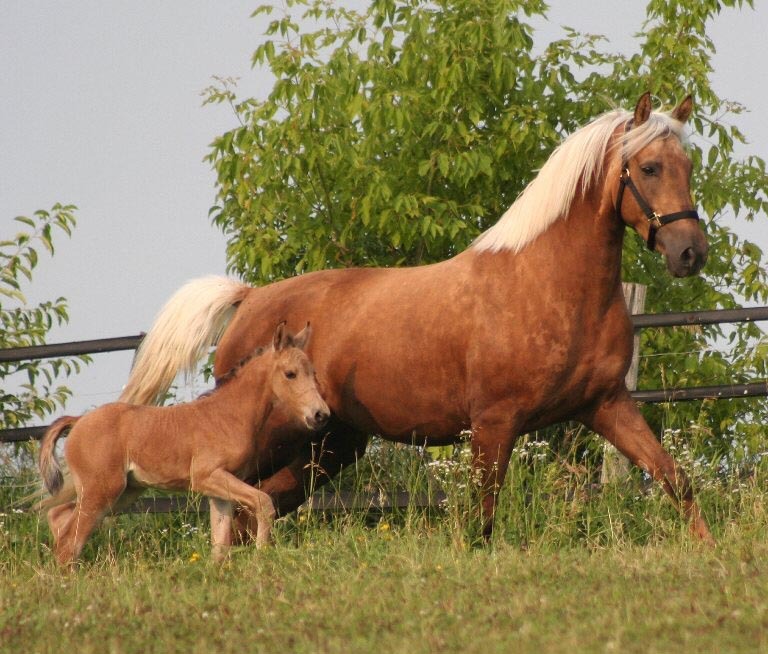 DREAM CATCHER ANGYL (RDK's Shilo X Valdez's Maravilla), 2000 palomino mare with her first foal, the 2004 palomino colt DEVINE PISTOL PETE, by Sandrock Joel. Angyl has an interesting "bleach spot" on her shoulder that may be due to a somatic mutation. 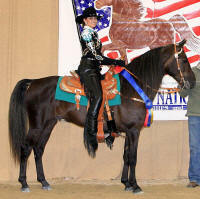 Both horses are owned by Devine Morgans, Lincoln, MT. Single cream dilutes can be very dark in shade; not all are the stereotypical "golden" color. In addition, as they age they often darken from the effects of the sooty gene. This is METIGOSHE MARIAH (Beda Acres Gold Mercedes, palomino X Metigoshe Marquessa, black chestnut), a 2003 filly owned by Darrell Charlton. 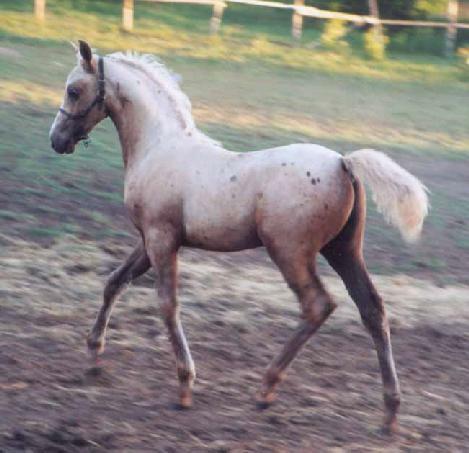 Born looking like a typical palomino foal (first photo), Mariah darkened as a yearling (second picture) to a shade of palomino that is often mistaken for flaxen liver chestnut or silver dapple. In the winter as a two year old she was more obviously a dark palomino, but presently (last two pictures) she looks very much like a non-dilute liver chestnut. Never underestimate the power of sooty! Mariah has been color tested by UC Davis and the results show that she is indeed palomino. 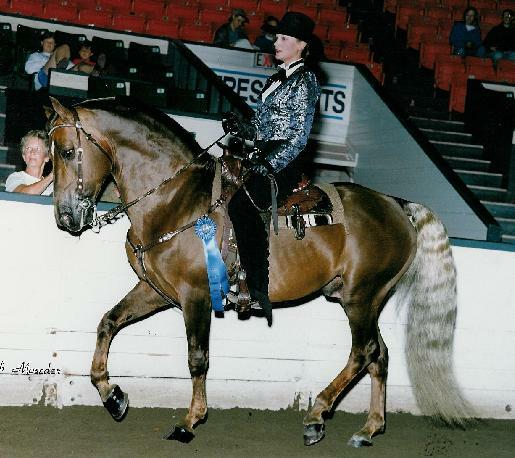 Sherry Siebanaler on the 1993 palomino Morgan stallion ABCM LIZ'S DREAMWALKER (Sunhills Montana x Meziadan Mezalee) performing a reining freestyle. Megan Motter, then age 8, on 28 yr. old OAK ACRES PET (Honor x Oak Acres Goldie). 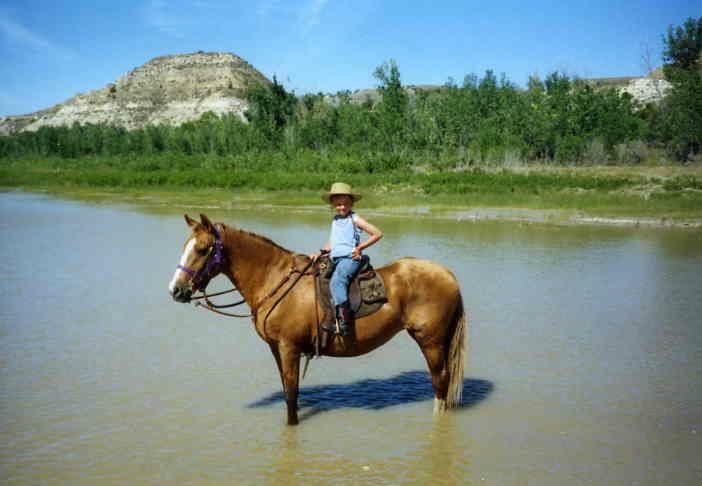 She and Pet were cooling off in the Little Missouri River while on the NDMHA Annual Trailride in August 2004 at Teddy Roosevelt National Park, Medora ND. Pet was foaled in 1976. 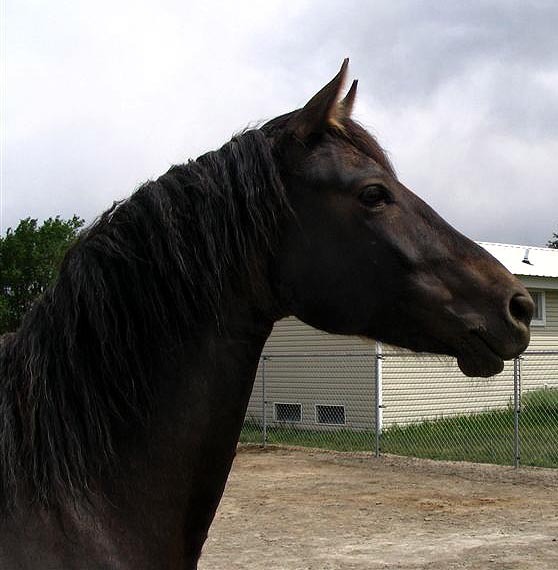 Pet was owned by Prairie Hill Morgans. 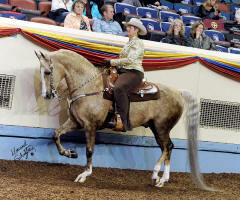 CORAL FOREST (World's Edge Goldoak X Kennebec Topaz), 2004 palomino mare owned by Laura Behning of Brookridge Morgans. 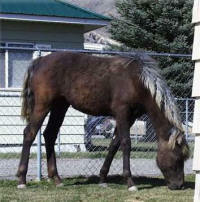 Shown on the left as a foal and on the right at age 6. 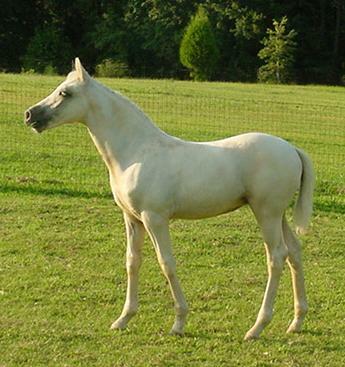 Coral is at the most pale end of the palomino spectrum; she essentially looks like a mature gray horse, as she is literally "white". While she is also similar in shade to a cremello, she has dark eyes and skin, whereas cremellos have pink skin and blue eyes. 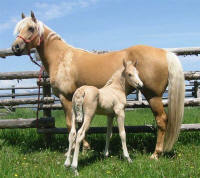 Palomino foals can be born a very pale shade, usually darkening to gold after the foal shed; this has not happened with Coral. More pictures of Coral can be seen here. 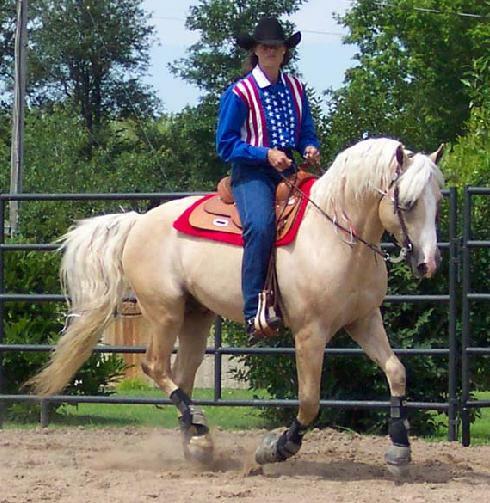 ANCAN TRUE COLORS (Fiddler's Blackriver X Aquila's Miss Bee Haven), 2002 palomino stallion owned by Ancan Morgans in Davison Michigan. 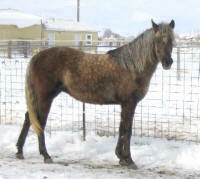 This stallion has a partial blue eye, and has sired offspring who also have a blue eye or partial blue, some of which can be seen here. The dark spots on his body are Bend Or spots (named for a famous racehorse of the same name that had these markings), a not uncommon feature particularly on chestnut and chestnut-based colors. Weanling photo by Anne Wyland; adult photo by Laura Behning. MAC'S LITTLEBRITCHES (Mac's Baby X Golden Judy), 1989 palomino gelding owned at the time this picture was taken by Craig Cook of AR. 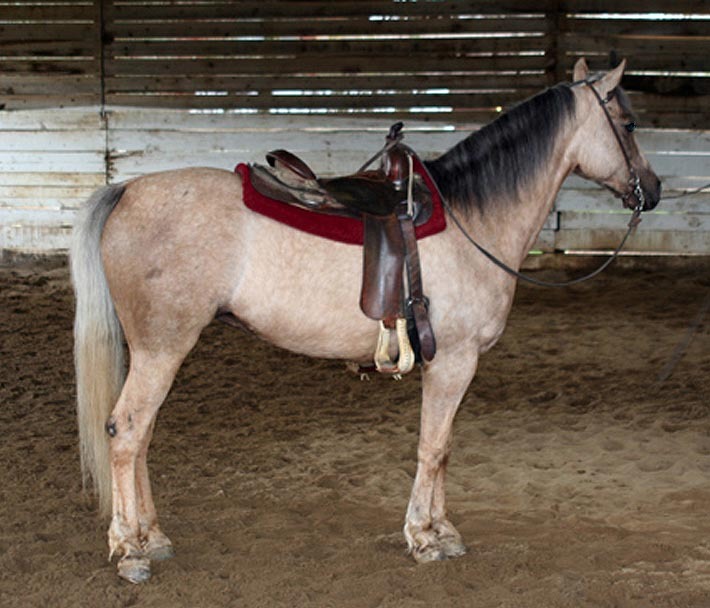 This horse is a prime example of a palomino so dark and "red" as to be mistaken/misregistered as a chestnut. The palomino fillies to the right of him are his daughters, one of which is from a chestnut mare, proving that their sire is indeed a palomino. Years of selection for dark shades in the Morgan's "traditional" colors has made dark and sooty buckskins and palominos, like Mac's Littlebritches, more commonly seen than in some other breeds. SPRINGTOWN CHAMPAGNE (Diamond Jim Brady X Satin Marigold), a 1984 dark palomino stallion who was owned by Joelyn Kennedy. He is the sire of the well-known cremello stallion, Amberfield's Desperado. Photo by Bob Moseder. ROCKING M MORGAN GOLD (Rocking M Diamond D X Joley Blond), 1987 palomino stallion. GOLDTREE MENOLLY (Culpeper Crescendo X Render's Gold Flame), 1990 palomino mare bred and owned by Loretta Brown, Goldtree Morgans. 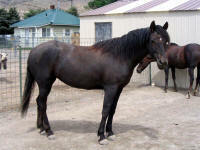 Menolly was a multi-champion Western Pleasure horse. She is shown here with Jessica Cavanaugh up. Photo by Bob Moseder. 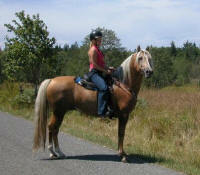 The late ADIEL'S CASINO GOLD (Sweet's Dexter X Eden Rose), 1995 palomino stallion. Casino was owned by Meadowlark Morgans, Mike and Linnea Sidi, Loveland CO. Photo by Laura Behning, who had Casino on lease from fall 2001 to spring 2002. To see more of Casino's visit to Georgia, visit Casino's page. 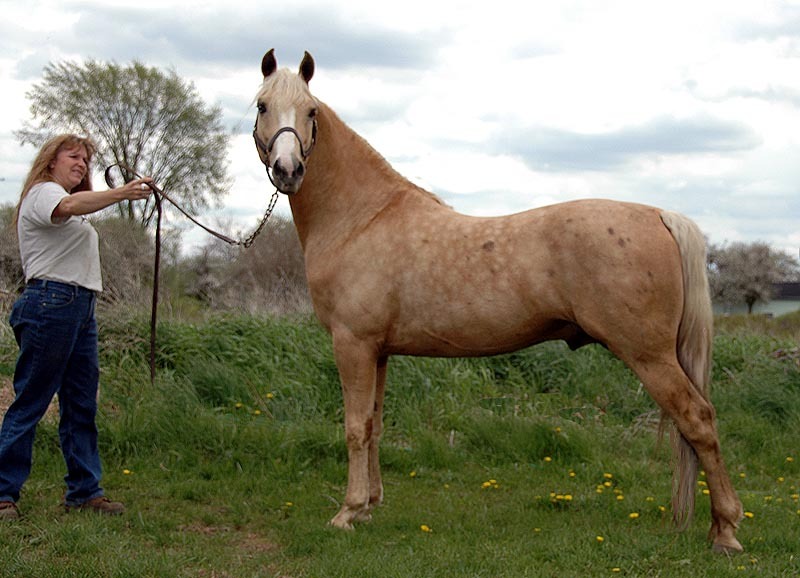 UDM GOLD MINE (MEMC Tequila Cuervo X Double M Gale Force), 1999 palomino stallion (pictured as a two year old) owned by Kathy Gutting. Valerie Siemer is driving. Photo by Shiflet. 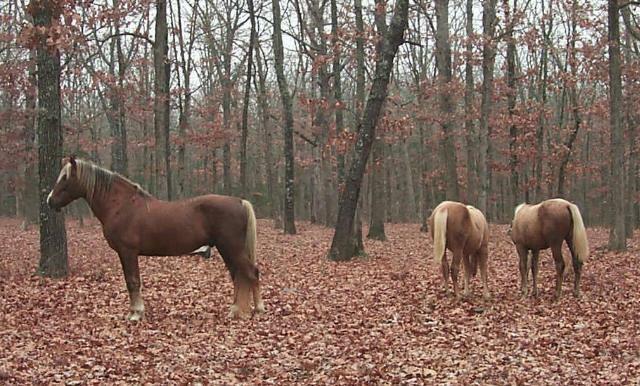 Left is the 1997 palomino mare TMB AIREBELLA (Carrollton X Babylon Dark Jezzebell) and right is her sire CARROLLTON (Culpeper Crescendo X Render's Gold Torch), 1990 palomino stallion. Susan Martin and Jessica Cavanaugh up. Both horses owned by Babylon Ranch, Lynn and Steve Burch, MI. Photo by Bob Moseder. WORLD'S EDGE GOLDHAWK (Californio X Funquest Ruby), 1988 palomino stallion owned by Harvey Seidel, Themopolis, WY.